Presidential candidate Elizabeth Warren is not satisfied with the proposal to raise individual income tax top rates to the 70–90% range. She has an even more radical idea as reported in this article. She wants to tax your wealth. Income taxes have always been a slippery source of revenue for governments. Back in the 1950s and 1960s, it’s true that certain income tax rates were in the 70–90% bracket. These super-high rates usually applied only to “unearned income” such as dividends and interest, but they were real nonetheless. What is left out of that story is that the tax code was loaded with deductions and credits for investment in oil, real estate, new equipment and many other categories. Investors could claim investment tax credits, accelerated depreciation and amortization, depletion allowances and much more. Best of all, the tax losses from one investment could be written off against other income (say, from a doctor’s or lawyer’s ordinary income). The result was that when statutory rates were 70%, the effective rate (the amount actually paid) was closer to 30%. Since then, tax rates edged up to 40% (under Bush 41 and Clinton), but the deductions never came back. So effective rates climbed closer to 40%. 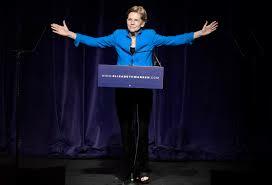 Warren’s plan to push rates over 70% will do serious economic harm in the absence of the old tax shelters. But that’s not enough for her. She wants a direct tax on wealth. This includes property, stocks, bonds, houses, boats and swimming pools. She claims it will only apply to the “ultra-rich” (who will move to Puerto Rico to avoid it), but before long it will be targeted at those who are only modestly well-to-do. Democrats are in a race to see who can move furthest to the left and be the most radical. So far, Elizabeth Warren is winning.